SMEs can now access benefits including real-time fleet data and a no-quibble tyre replacement and 24 hour on-call solution under a new service from Skoda. Run in partnership with Volkswagen Financial Services | Fleet, Skoda’s SME Direct fleet package is exclusively available to small businesses running less than 20 cars on their fleet and includes free access to the MyFleetPro web portal, which can be used to track the performance of the fleet and monitor vehicle efficiency and usage. SMEs can also benefit from their own dedicated account manager and a 24-hour, UK based telephone concierge, which can help drivers with accidents, breakdowns and service bookings as well as windscreen and tyre repairs. 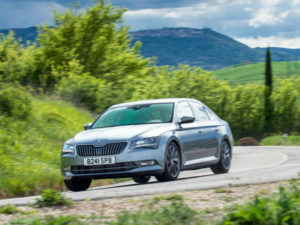 Available from select ŠKODA retailers, the package also enables SMEs to pool their mileage to help avoid charges on over-mileage vehicles and includes £100 cover for end-of-contract damage costs and a no-quibble tyre replacement deal. Under the offer, all vehicles purchased before 31 December will also get a free dash cam, helping SMEs to slash insurance premiums and benefit from proof against fraudulent accident claims.